BDO runners (L-R) Emily Blauberg, Dominic Kearney and Amy Gallagher. AAP image, John Gass. BUSINESSES across Brisbane are pulling on running shoes to take part in this week's Bridge to Brisbane - and all for a good cause. 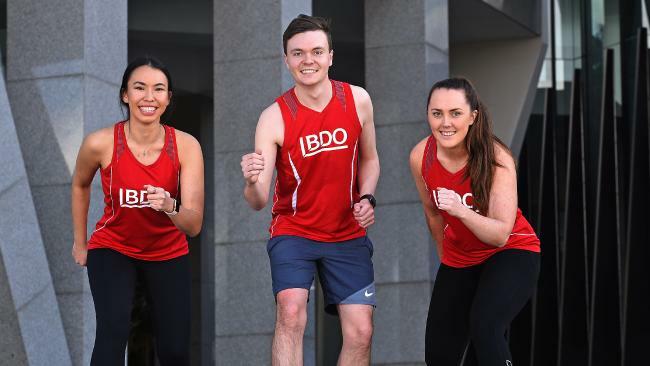 Dominic Kearney, a consultant at BDO, is running with colleagues Emily Blauberg and Amy Gallagher to raise money for the Black Dog Institute. "A few of my colleagues were running in the Bridge to Brisbane so I decided to give it a go with them," Mr Kearney, 23, said. "I've been training for about three months, running 5km each day either at lunch time or in the afternoon after work - and I did a 10km practice last week, so I'm feeling pretty ready. "BDO has a running club, and has been pushing training sessions and encouraging us to get outside at lunch time and train. "It is a supportive workplace when it comes to flexibility, work/life balance and being active." BDO Brisbane managing partner Tony Schiffmann said more than 70 staff members were taking part in Queensland's biggest community fun run this Sunday. "Bridge to Brisbane is part of BDO's 'BWell' corporate wellness program and this year includes an eight-week training program prior to the race. The runners have a weekly coach who takes them through some tips and techniques," he said. "Our staff love this run because it's a fun course and a great team-building opportunity, bringing colleagues together and strengthening friendships, while raising money for important causes." More than 30 per cent of the 30,000 runners taking part on Sunday belong to corporate teams.